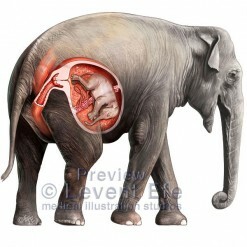 Medical illustration depicting the Endobronchial Ultrasound-guided Transbronchial Needle Aspiration procedure. 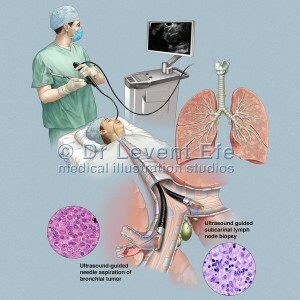 Endobronchial ultrasound-guided transbronchial needle aspiration is a special bronchoscopic technique used to take samples of body tissue from inside the chest. The scope has a special ultrasound probe on the end. This provides ultrasound images that are transmitted to a TV monitor for the doctor to see. 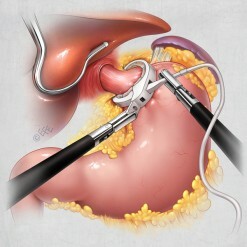 The EBUS TBNA technique is used for diagnosis and staging of bronchial diseases, including mediastinal or peripheral pathologies, subcarinal and parabronchial nodes and parenchymal abnormalities. 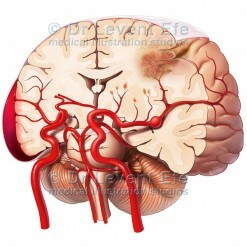 It is also a useful technique to diagnose lymphatic diseases e.g. 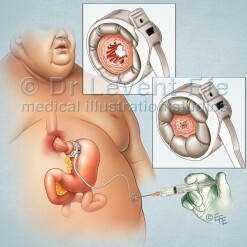 lymphoma or adenopathy. 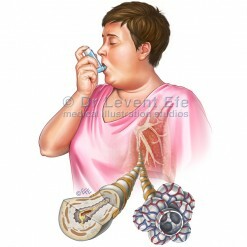 It has been established as a minimally invasive, safe and cost-effective bronchoscopic procedure. Transbronchial needle aspiration may be used to investigate enlarged lymph nodes in the mediastinum, diagnose conditions such as sarcoidosis or tuberculosis, diagnose cancer outside the bronchi, and 'Stage' cancer by taking tissue samples from the lymph nodes. The medical illustration depicts the specialist using the bronchoscope to observe and take samples from a tumor in the bronchial wall and lymph nodes outside the bronchi, in the mediastinum. SKU: M07. Category: General Medical (M). Tags: bronchial_disease, bronchoscope, bronchoscopy, EBUS, Endobronchial, endobronchial_ultrasound, Endobronchial_ultrasound_guided_transbronchial_needle_aspiration, lung_cancer, lungs, pulmonary, sarcoidosis, subcarinal, TBNA, transbronchial_needle_aspiration. Transbronchial needle aspiration may be used to investigate enlarged lymph nodes in the mediastinum, diagnose conditions such as sarcoidosis or tuberculosis, diagnose cancer outside the bronchi, and ‘Stage’ cancer by taking tissue samples from the lymph nodes.